Transparency Market Research has released a new market report titled “Automotive Heat Shield Market - Global Industry Analysis, Size, Share, Growth, Trends, and Forecast, 2018–2026.” According to the report, the global automotive heat shield market is expected to expand at a CAGR of more than 3% during the forecast period. Internal combustion engine is a tremendous heat-producing component of the vehicle. The heat generated by the engine can damage the parts surrounding it. Exhaust manifold, turbochargers, exhaust pipes, and catalytic converters are major sources of heat in a vehicle. The heat emitted by these components needs to be diverted in order to avoid any kind of damage to the adjoining sensitive components. Heat shields plays a vital role in the vehicle, either by deflecting or absorbing the heat generated by the components in order to avoid any damage to the other components. Heat shields effectively enhance the performance and efficiency of the engine at considerably high temperature, which is primarily driving the global automotive heat shield market. Stringent emission norms, raised awareness among consumers, and increase in global warming due to increased pollution level are prompting vehicle manufacturers and consumers to install add-on accessories in vehicles in order to enhance engine performance and subsequently reduce pollution levels. This, in turn, is fueling the demand for vehicle performance boosting accessories, such as turbochargers, and emission control devices, such as exhaust gas recirculation techniques. These accessories produce a large amount of heat that needs to be regulated in order to achieve optimum performance of the adjoining components. Therefore, increase in demand for turbochargers and other emission control devices is fueling the demand for automotive heat shields. Raised per capita income and increased awareness among consumers is fueling the demand for vehicles and in-vehicle safety, which in turn is boosting the demand for heat shields. The global automotive heat shield market is primarily restrained by the rapid rise in demand for battery electric vehicles, which do not require a heat shield. Battery electric vehicles do not have any component that produces heat, therefore, heat shields are not required for battery electric vehicles. Heat shields are primarily utilized with major heat generating components such as exhaust manifold and header, catalytic converter, exhaust pipe, turbochargers, and spark plug. Moreover, heat shields are also preferred to protect sensitive components such as fuel lines, electric wiring, and oil lines. The exhaust manifold and header are intentionally covered with a reflective heat shield that traps heat near the exhaust manifold and header in order to keep it hot. Higher temperature of exhaust manifold and header enhances the scavenging capabilities of the engine, which results in overall increase in engine performance and efficiency. Exhaust manifold and headers can be either covered with a rigid heat shield or can be wrapped using a flexible strip made of titanium or fiber glass. Wrapping the exhaust manifold and header results in trapping of moisture, which may lead to corrosion of the manifold and header surface and consequently, reduce the life of the manifold and header. Furthermore, wrapping the manifold and header is time consuming and costs much more than that of using a rigid metallic heat shield. Thus, manufacturers prefer to utilize a shield instead of a wrap. The exhaust manifold and header heat shield segment is projected to expand at a CAGR of more than 3% during the forecast period. Surge in demand for efficient vehicles, rise in pollution levels, stringent emission norms implemented by governments on vehicle manufacturers in order to lower the pollution level, coupled with raised awareness among consumers, are fueling the demand for vehicle efficiency boosting accessories such as turbochargers, intercoolers, and catalytic converter. This, in turn, is fueling the demand for turbo heat shield and catalytic converter heat shields. Therefore, the turbo heat shield segment is anticipated to expand at CAGR of about 5% between 2018 and 2026. Muffler heat shields and exhaust heat shield is either made of aluminum or steel. These heat shields are rigid in nature. Aluminum is widely preferred due to its low weight and higher heat reflective capability. Rigid heat shields can last till the vehicle life and are inexpensive; therefore, demand for rigid heat shields is rising from vehicle manufacturers. Thus, the rigid heat shield segment accounted for major share of the market, in terms of revenue, in 2017. The global automotive heat shield market has been segmented into five prominent regions: North America, Latin America, Europe, Asia Pacific, and Middle East & Africa. 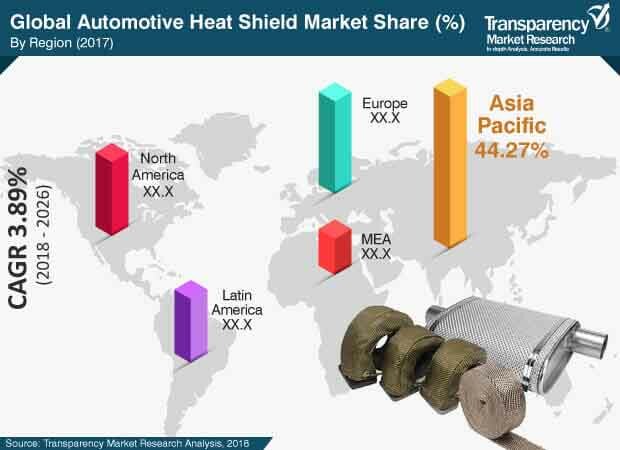 Manufacture of a large number of passenger and commercial vehicles, rise in concern about in-vehicle safety and comfort, increase in per capita income, and shift in tendency toward owning a luxury or premium class vehicle have led Asia Pacific to hold a major share of the global automotive heat shield market. Demand for luxury and premium class vehicles is rising in Europe, which in turn is fueling then demand for heat shields in the region. Demand for flexible heat shields, such as heat barrier blanket, exhaust heat tape, exhaust heat wrap, and heat shield tapes, is rising in Europe. North America is witnessing a significant demand for vehicle modification, which is fuelling the demand for attractive heat shields such as turbo blankest, fabric heat shields, heat shield tubing and heat resistive tape for car exhaust. Key players operating in the global automotive heat shield market include Federal Mogul Holdings Corporation, Autoneum Holding AG, Dana Holding Corporation, Lyndall Inc., UGN Inc., Happich GmbH, Elringklinger AG, and Progress-Werk Oberkirch AG.